STAFF at a Henley business raised more than £2,800 for Sue Ryder with a 10km sponsored walk in memory of the owner. Primary Times took part, together with shareholder Doug Ash. Steve Edwards, who ran the business in Newtown Road, passed away at the charity’s Nettlebed hospice in December. The walkers went from the Unicorn pub in Kingwood to the Row Barge in West Street, Henley, via Henley Golf Club. These were three of Mr Edwards’s favourite places. Before setting off, they were served coffee and biscuits by Niki Clark, landlady of the Unicorn. They stopped off at the golf club in Harpsden to collect donations in buckets emblazoned with a picture of Mr Edwards. 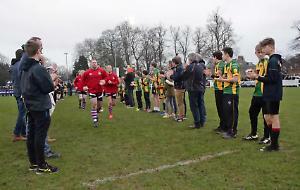 After the walk, they had lunch at the Row Barge before attending the Henley Hawks match against Cinderford at Dry Leas, where they collected money from spectators. Organiser Helen Pattison said: “We did it for Steve and we were very lucky with the weather. He must have been looking down making sure it didn’t rain on us! The other walkers were Anita Niklas, Tina Mayberry, Alison Spiers-Davis, Carol George, Charlotte Shand, Marie McArthur, Sally Teasdale, Katy Kobik, Sue Douglas, Julie Daruvalla, Sarah Lorrimer-Riley, Niki Ince-Green, Phoebe Ince-Green and Hayley Ackerley.